It’s good to have received so many early responses to my latest blog. It would be good to hear from more of the 5000, and from anyone who has got any good marketing ideas. October 31, 2008 at 12:51 am eI think it will be a damp squib.Anyone who expects anything more than being able to sell a few copies to family and friends is most likely to be disappointed.Maybe one or two people will go on to greater things. But I doubt it. I submitted a PDF copy of my book “Ordinary Monsters” to YWO yesterday. The book was written two years ago and has bounced back from many a publisher. Twice it was short-listed in competitions, one with an agency, and the other with an arts council. Both times, it failed the final hurdle. A number of agents have written to say the liked it a lot, but didn’t love it enough to risk time and money. Two publishers that said they were interested, found themselves under pressure from an early version of the credit crunch and bailed out on my book before we got to the contract stage. I’ve gone through a lot of edits with this book. I’ve spent a whole load of money on stamps and envelopes, but I never lost faith in the story, in the characters and in my own writing style. I just couldn’t get it noticed. I’m a published author with Pearson’s Education. I write non-fiction books and articles on computers, most of which are published in the US. Non-fiction is where I make my money, but fiction is where my heart lives. When the YWO “offer” arrived in my mailbox, I was on the brink of giving up and tossing the MS into a darkened drawer never to be seen again. I had considered Self Publishing, but the process appeared complex and full of traps, reading a few blogs and hearing of their bad experiences was enough to put me off. And as Jane says, no one makes money from self publishing fiction, apart from the golden few, but if you are going to bet on those odds, you may as well buy a few more lottery tickets this weekend. So why did I bother? Because I believe in the book. I think it deserves to be published and because I don’t want to get personally involved with self-publishing directly, I prefer it to be handled by someone else. Yes I know there are others out there, but the advantages as I see it are wafer thin. The thickness of a fag paper, as my dad used to say, isn’t really that much help! Once the book is published, I intend buying a copy, then looking to see if there are any good blogs on marketing. As I say, my main income is non-fiction, but this will be an interesting sideline. I hope other people are viewing it in the same light, as making money, getting rich, becoming famous through his scheme is NOT going to happen for 99.9% of all 5,000 books (someone tell me how many books 0.1% is). Good luck to all and to any “well meaning” individuals that reply to this telling me I am a fool and I should do this that or the other instead, please don’t bother. My freedom of expression as an individual living in a democracy is to be apart of YWO initiative. If that is a con, then big boy that I am, I will take it on the chin. I am obviously in Paul’s camp on this one. I believe in what I have written. People have read it and I know that they are not just being polite when they say that they enjoyed it, laughed out loud and cried, and one of them not only read it in the space of a weekend but went back and reread it. I won’t be so vain as to claim that it is a great work of literature, but a major problem as I perceive it is that I have written a thriller in which the ‘hero’ is a ‘lad novel’ character, not a square jawed athletic professor- and publishers do not like mixed genre. And like Paul I don’t have the ability (or the money) to self publish, neither do I have Jane Smith’s compendious knowledge of publishing (Do visit her blog, it is very informative.) I agree with Jane that it would be good to hear from someone from the industry who can put a more solid argument forward. Unless the truth is that there is no such person, in which case it would be good to hear from Ted Smith of YouWriteOn. Although I suspect that he is rather busy at the moment. Youwriteon 5000: today’s the day… or is it? As I write this it is the beginning of a portentous day… Halloween? No, it is the final date by which manuscripts must be submitted to YouWriteOn for publication. Will this be remembered as the date when publishing changed forever, or will it be a damp squib? Whatever the answer, if any of the novels in the ‘thriller’ and ‘adventure’ categories are written with an iota of the passion and expertise evident in the many blogs on the YouWriteOn scheme to publish 5000 authors, we are guaranteed at least one work of genius. I would like to draw the attention of readers of this blog to Jane Smith’s comment on my last post. Apologies to Jane for lifting such a large chunk from her blog- her site gives permission for only one hundred words, and I went far beyond that- but thanks Jane for graciously letting me keep it. And for the link on your site to my blog, which has brought several hits my way. This will mean that a few more people will hear of my novel ‘Tasting the Wind’ and if that increases its sales in any way that will benefit Derian House, the children’s hospice that will benefit from my royalties. I am also hoping that more of the 5000 will contribute to the debate and give their reasons for going down the YouWriteOn route. The contributions on several sites are boringly one-sided and could do with a greater mix of viewpoints. So the debate rages on about YouWriteOn and its publishing 5000 books by Christmas venture. Admittedly, I have been concerned that this could lead to 4999 turkeys being available just in time for christmas (or after, if the cynics are correct.) I obviously don’t include my novel in that number because it is high quality writing and has been crafted and edited over several years. Hopefully, the amount of publicity generated by the critics of YouWriteOn will create more interest and lead the curious to test for themselves whether it is statistically possible for 5000 writers all to be bad. What I don’t like is the often patronising references to the 5000 and their motives. No, we are not all people who simply want to see our names in print. Some of us have been through the process of submitting to publishers and agents works which we believe in and have worked damned hard on. For us the choice to submit to YouWriteOn comes from the blinkered view of a publishing industry which will not consider anything which cannot be pigeonholed. Whether or not any of the 5000 will gain any level of success will have to be seen. But if there is only one, then doesn’t that make the odds of success rather better than those of an unconventional novel attempting a conventional route? 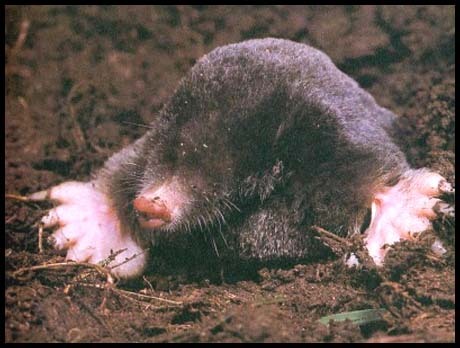 Interesting Medical Fact Number 1: I’ve just had a mole removed from my back. No, not a fluffy little creature (I just like the picture, and thought you’d rather see it than a skin blemish.) It changed colour and shape when I was on holiday, so I went to see the Doc, who said it had to come off. The procedure was painless. And afterwards the Doctor gave me the scissors and other implements he had used. Apparently sterilisation is no longer good enough because of superbugs, so they would only throw them away. It occurs to me that I could commit the perfect crime- all of the clues would point to someone who has access to surgical instruments. And now I’ve told you, I’ll have to kill you… and eat your wife. Interesting Medical Fact Number 2: My Dad has just had his second knee replacement. The first was done in a BUPA hospital, the second in an NHS hospital. The procedure, the staff, the food and the aftercare were all far superior from the latter. You Write on… and on… and on. Every Christmas the facts and figures are bandied about over how one little old man can possibly find the time to issue presents to all of the children in the world. This year the debate will be overshadowed by how one man (Edward Smith) will manage to make 5000 novels available between the Halloween closing date and the Yuletide target. Try googling ‘You Write On’ or keywords such as ‘publish, 5000, authors’ and nine times out of ten you will come up with a literary web page or blog which is getting its knickers in a twist. The subject is the offer by You Write on and Legend Press to publish 5000 new authors by Christmas. The concerns range from motive through anxiety about thousands of poor quality novels being stored electronically, to good novels being lost to larger publishers and doubt about the ability of the operation to put so many books on POD in such a short time. I have a confession. OK, unfashionable as it would seem to be, I am one of the 5000. And I don’t mean lepers, despite the fact that many sites see us as ‘literary wanabees’ or deluded objects of pity. I am going to publish my novel ‘Tasting the Wind’ through You Write on, and I am going in with my eyes open. Firstly, although the word ‘scam’ has been used, I have tested a few of these (notably the Writers book agency) and this does not have the same flavour. There is no need to part with any money- unless you wish to buy an ISBN number- whereas you don’t have to look too far into the real scams before you are asked to show your commitment to your work by getting out your cheque book. And yes, of course Legend Press will make money from this- why shouldn’t they? It has been pointed out that if the author is the only person to buy their novel (which in some cases may be true) then only Legend Press stands to gain. Look up the number 5000 on sites about publishing, and it comes up as the number required for a successful print run for a small publishing company. And yes, the novels are not chosen on merit- it’s the first 5000 to email. So why is this any different to self publishing? Critics have also questioned the charge for an ISBN number of £39.99. Several POD and self-publishing sites charge more than this. Yes, You Write On will get them far cheaper through buying in bulk, but I only want one number, and I don’t have the money to self-publish on my own. Is it me, or do the criticisms seem strange when we accept the dictates of a publishing industry which sees books as ‘units’ to be moved and is guided by what will sell rather than what is good? Yes, there will be a number of people who are deluded about their abilities, but there willo also be a number in which I would like to count myself, who have created a book of which they are proud, but which current profit orientated publishing trends will prevent from ever seeing the light of day. The trend is for genre, and if you might have written a work of genius, but if it cannot be easily pigeonholed the big publishers will not touch it. Earlier this year I wrote to Dean Koontz and asked for advice. His letter recommended that new wrtiters go for the ‘high concept novel.’ My second novel will be, but my first is from the heart, revised over ten years and I believe in it. But when you send it to agents you get the standard letter which gives no idea about how far it is from what is required. You Write On do not appear to be a tin pot organisation. They have Arts Council Funding and affiliations to the literary and publishing world which include Random House. Some of their authors have gone on to clinch deals with the bigger companies. Let’s put it another way. I once received a rejection letter from an agent which said that they received three hundred manuscripts per week but only took on three writers per year. So for every 15,600 submissions only three are accepted. Chances are at least one of the 5000 You Write On authors will get noticed, so the odds are better than going through an agent. And is £39.99 to get onto Amazon so much when you add up all of those postage stamps to send your manuscript to agents with return postage? So yes, I’m going ahead with it, and when my novel is published I will be adding a link to all of my networking sites. I will also be talking to my local children’s hospice who will receive 50% of my royalties. So if you are reading this please buy ‘Tasting the Wind’ when it is available.Not only can I guarantee you a good read- some of your money will be going to a good cause and not to a big publisher. How good will that feel?